You want to make sure you maximize on your financial reward when selling your home. But how do you guarantee that you receive the max value for your house? Price it a LITTLE LOW – This may see counter intuitive, but let’s look at this for a moment. A lot of homeowners think that pricing their homes a little OVER market value will leave them with room for negotiation. In actuality, this dramatically lessens the demand for your house. 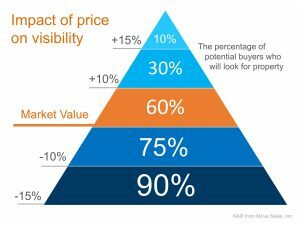 Instead of the seller trying to “win” the negotiation with one buyer, they should price it so that demand for the home is maximized. By doing this, the seller will not be fighting with a buyer over the price but will instead have multiple buyers fighting with each other over the house! CHECK THIS CHART OUT.